As the old saying goes, "If you want a friend in Washington, get a dog." Harding also owned Old Boy (bulldog). The Bush family also had two other dogs while at the White House, Miss Beazle (Scottish terrier) and Spotty (English springer spaniel). Lincoln owned Fido prior to his election as president. After he was elected, he worried that Fido could not survive the transition to Washington, D.C. (Fido hated cannon fire and train rides). Lincoln left Fido with close friends in Springfield, Illinois, under the condition that he never be scolded and that he be allowed to continue living as an indoor dog. Fido died less than a year after Lincoln was assassinated. Roosevelt, a well-known outdoorsman and animal lover, had several other dogs: Blackjack (Manchester terrier), Jack and Peter (terriers), Pete (bull terrier), Sailor Boy (Chesapeake Bay retriever), Skip (rat terrier), and Manchu (Pekingese). In addition to Rex, the Reagans had Lucky (Bouvier des Flandres), Victory (golden retriever), Peggy (Irish setter), Taca (Siberian husky) and Fuzzy (Belgian sheepdog). The Coolidges loved dogs. In addition to Rob Roy, they had Prudence Prim (white collie) Peter Pan (terrier), Paul Pry (Airedale terrier), Calamity Jane (Shetland sheepdog), Tiny Tim and Blackberry (Chow Chows), Ruby Rouch and Bessie (collies), Boston Beans (bulldog), King Cole (German shepherd), and Palo Alto (bird dog). In addition to King Tut, Hoover had Pat (German shepherd), Big Ben and Sonnie (fox terriers), Glen (Scotch collie), Yukonan (Eskimo dog), Patrick (Irish wolfhound), Eaglehurst Gillette (setter), and Weejie (Norwegian elkhound). Additionally, the Kennedys had Clipper (German shepherd), Gaullie (poodle-wolfie), Charlie (Welsh terrier), and Pushinka (a mixed-breed puppy of Soviet space dog Strelka). Pushinka was given to Caroline Kennedy by the Soviet Union Premier Nikita Khrushchev. The Nixon family also had two other dogs, Pasha (terrier) and Vicki (poodle). Johnson also had four beagles: Edgar, Freckles, Him and Her, and Blanco (a white collie). Truman also had one more dog, Mike (Irish setter). 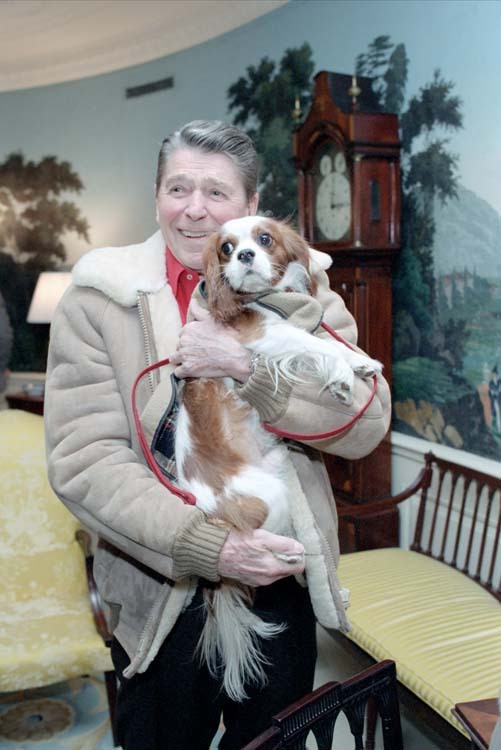 Additionally, the Fords had Misty (who was Liberty's puppy, born at the White House). Fala is considered to be the most famous and iconic presidential pet of all time. A statue of Fala stands alongside Roosevelt at Washington, D.C.'s Franklin Delano Roosevelt Memorial, the only presidential pet with that honor. Additionally the Roosevelts had Majora (German shepherd), Meggie (Scottish terrier), Winks (Llewellin setter), Tiny (Old English sheepdog), President (Great Dane), and Blaze (bullmastiff).